The DD-1 Double Overdrive is essentially two different distortion circuits in one, combining our DRV-1 Overdrivulator and our DRV-2 Uberdriveulator in a single pedal chassis. 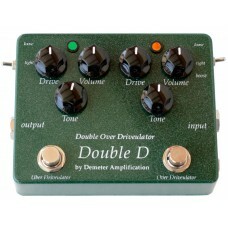 Both sides of the unit can be set independently, allowing you to have two completely separate overdrive stages. This can be very handy when you really want to kick it up a notch mid-solo, or have a mellow distortion turn into a full on beast from hell. This unit is True Bypass using an ALCO heavy duty Footswitch. As with all Demeter products, this pedal is hand built in the USA using the finest components possible. The first stage of the pedal is the DRV-2 Uberdriveulator circuit. This circuit has a great deal of headroom, making it perfect for a boost or moderate drive. Loose - Uses Silicon diodes in the overdrive circuit for a moderate amount of gain. Tight - Uses an LED in the overdrive circuit, which results in a large amount of clean headroom before clipping. The second stage of the pedal is the DRV-1 Overdriveulator circuit. This is a much higher gain circuit with a smaller amount of headroom. You can set the drive low on this side for a subtle, tube screamer like overdrive, or get a screaming modern overdrive sound with the drive cranked. Tight - Uses Germanium diodes in the overdrive circuit, which results in a large amount of clean headroom before clipping.